I was impressed when I saw The Martian this past week. I had heard nothing but amazing things about it, and I was excited to see it and look for similarities between it and another space disaster movie, Apollo 13. I did get a sense of déjà vu, but it wasn’t from a mission to the moon, but from Mission to Mars. That movie came out in 2000, and it’s an absolutely miserable experience to sit through. The Martian takes the route of telling its story mainly from the perspective of the man who’s stranded on Mars while Mission to Mars tells the story from the perspective of the stranded man’s rescuers. And that’s just the beginning of how they diverge. I’m just going to call the characters by the names of the actors playing them because it seems pointless to call them anything else. And if you don’t want to have the plots of both of these films spoiled, turn away now. With that in mind, let’s take one small step and explore how similar The Martian is to Mission to Mars. We see a group of astronauts who have already established a base of operations on Mars. One man is stranded on Mars after surviving a disastrous storm. A rescue mission is hastily dispatched to Mars. A character gets stuck too close to the surface of the planet, and his solution is to expose himself to the vacuum of space. The rescue team returns to Earth with the stranded astronaut. Now we’ll go into more detail about where these films are similar and how they differ at each point, as well. In Mission to Mars, Don Cheadle and a few other astronauts are the first humans to land on Mars. We don’t get to see the historic moment of touchdown or them planting the American flag for the first time. We just suddenly see them already going about their business on the red planet after a brief introduction to all of the main characters in an opening scene that takes place on Earth. Similarly, when we first see Matt Damon and his crewmates in The Martian, they’ve already been on Mars for 18 days, and they aren’t even the first mission to mars, but the third. The astronauts share some playful banter, which helps the audience get acquainted with them, like what they did at the start of Mission to Mars. I like how Mission to Mars begins, showing the main characters relaxing at a barbecue and introducing us to some of the rules of the future they’re setting up. But the transition to Mars is jarring. They’re just suddenly there, no ceremony or anything else to call attention to how cool it should be. Total Recall did it so much better. 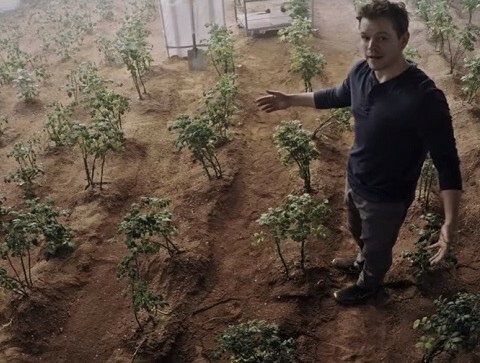 But in The Martian, we are immediately plunged into the Mars environment, which preps us for how much time we’re going to spend there during the film. I especially like the little callback to what day of the mission it is. That’s revisited quite a few times to let us know how crazy it is that Damon could last that long by himself. Everyone but Cheadle dies in a hellish storm that comes through the crew’s camp. Cheadle is left alone, and he manages to send a video message back to Earth telling them what happened. But after that he is unable to communicate at all with the people of Earth. A windstorm blows through Damon’s basecamp and Damon gets separated from his crewmates. They are forced to leave him behind because they believe he died in the storm. 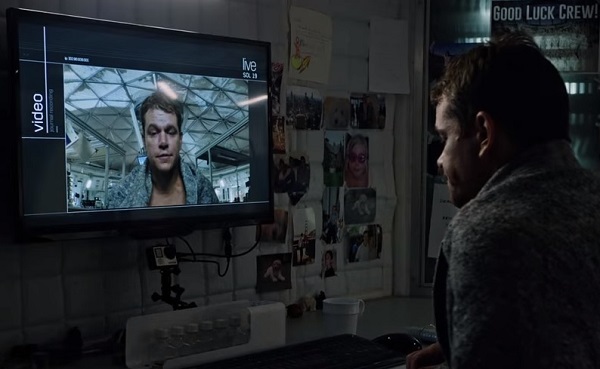 When he wakes up and stumbles back into their abandoned facility, he records the first of many video messages that he can’t transmit to Earth. But he does find a creative way to communicate with mission control via written messages. So one astronaut gets complete communication at first and then none later and the other gets no communication at first and then significantly more later. And Cheadle doesn’t appear again until close to the end while Damon is front and center the whole way through. Cheadle briefly explains how he managed to survive by growing plants while we get to see every step of Damon’s thought process as he grows a garden. Cheadle’s message is enough to get NASA to launch their next mission ahead of schedule. It’s not exactly a rescue mission because they think that there’s no way Cheadle will last long enough to be rescued, but they’re going to figure out what went wrong. When NASA learns that Damon is alive, they are hesitant to tell his crew. They spend months attempting to launch supplies to Damon to help him last a while longer, but when that effort fails, his crew volunteer to return to Mars to rescue their comrade. Sure, they aren’t originally intended to be rescue missions, but they both wind up accomplishing the same thing: Getting a stranded astronaut off Mars. 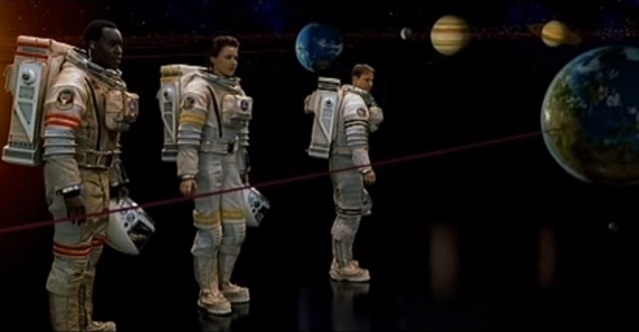 After the rescue team’s spaceship gets crippled en route to Mars, Commander Tim Robbins volunteers to go help the others latch onto an orbiting supply ship. Unfortunately, while he succeeds in getting the others aboard, he is unable to get himself safely aboard. He drifts closer and closer to the surface of Mars. His wife tries to save him, but she can’t. And even knowing that she can’t, she still refuses to save herself at his expense. So he decides to take himself out of the equation by removing his helmet and exposing himself to the vacuum of space. He’s dead in moments. There’s a scene near the end of The Martian that’s practically ripped from Mission to Mars when Commander Jessica Chastain tries to fly to Damon, who is floating in low orbit over Mars. But the rope connecting Chastain to her ship isn’t long enough and she gets halted midflight. She tries decompressing a large portion of the ship, but that’s still not enough. Damon, knowing that he’s doomed if he doesn’t think fast, cuts a hole in his glove and uses the escaping air to propel himself up to Chastain. They then get pulled to safety. Both astronauts expose themselves to the void, but one is a bit more creative than the other and makes it through alive. In the end, Mission to Mars pulls a lame Abyss twist out of left field and has Martians show up and tell the astronauts that life on Earth originated on Mars. It’s all very awkward. 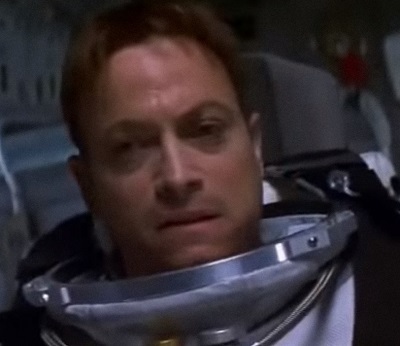 Then one of the astronauts, played by Gary Sinise, stays with the aliens while the rest of them get back on their ship and take Cheadle home. Once Damon makes it onto the spaceship, the film jump cuts to Earth. It shows him safely back home and also offers satisfying resolutions to every other character’s story arc. The Martian wisely chose not to introduce any weird sci-fi concepts at the end after working so hard to build a sense of realism into its story. 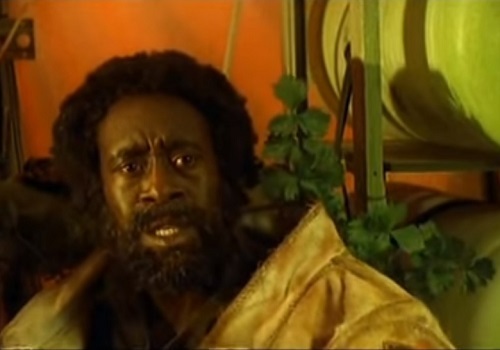 Mission to Mars seems to have taken a cue from Cheadle and went insane by the end. 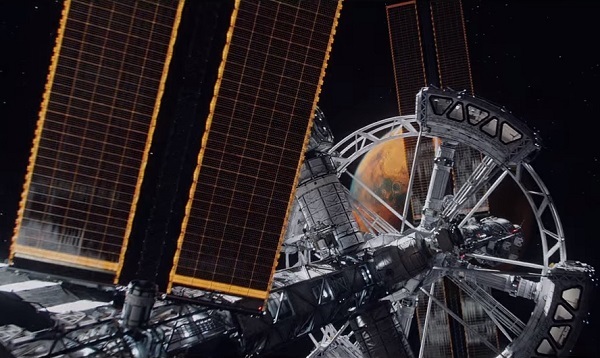 Why does The Martian succeed and Mission to Mars fail when they both build on a similar premise? It’s all about staying grounded. Mission to Mars attempts to give depth to its characters by adding a little backstory about their relationships so that we’ll care about their fates. But it’s not enough and they still just come across as one-dimensional, boring people. So nothing that happens to them really resonates. On the other hand, Damon is just an everyman who we can relate to because of how he reacts to his situation. For example, after losing the crops he had put so much work into, his first reaction is to shout and pound on the equipment that’s keeping him alive. It’s not rational, but that’s how any of us might respond without thinking. Everywhere Mission to Mars fails, The Martian succeeds. It’s as simple as that. They have a lot of plot points in common, but they diverge wildly in what they do with them. If nothing else, it’s nice to finally see another film compete with Total Recall for the best film set on Mars. This entry was posted in Movie Matchups and tagged drama, films, matt damon, mission to mars, movie review, movies, movies based on books, science fiction, the martian. Bookmark the permalink. I haven’t seen it, but I was told “Robinson Crusoe on Mars” had the same story as “The Martian”. That’s probably true. At least he had a pet monkey to keep him company. Matt Damon just has ’70s music that he hates. Very cool article. I am always intrigued by your match ups. Thank you. This one came together in an interesting way because I had planned on writing an article about a bunch of Mars movies talking about how rare it is to find one with no Martians in it. But the more I thought about it, the more I realized I just wanted to talk about Mission to Mars. The similarities were just so striking. Mission to Mars was one of the worst films I have ever seen. I remember talking my parents, brother, sister, and friend to go see it with me. It was directed by the guy that did The Untouchables! How could it miss? Well…it did. And badly. I read The Martian a couple years ago and I was excited to see my favorite director, Ridley Scott, pick it up and fast track it with the very capable Matt Damon as…well the Martian guy. I can’t wait to see it! Mission to Mars really is a beautiful disaster. I don’t know what Brian De Palma was thinking, either. His quirky, slow style of storytelling and directing just didn’t fit with science fiction. The Martian makes up for all of the shortcomings in that earlier film, thankfully. Misssion to Mars was absolutely enjoyable movie. And absolutely incomparable with Martian, totallly different story, MtM was not a sci-fi, it was movie about how it all begun. Thank you for sharing. I think the real way they’re incomparable is in their quality. Mission to Mars makes so many weird choices, from its music to its performances, that I find it hard to sit through. The two films may take a different angle on the story, but they share a a very similar setup. Very good article. 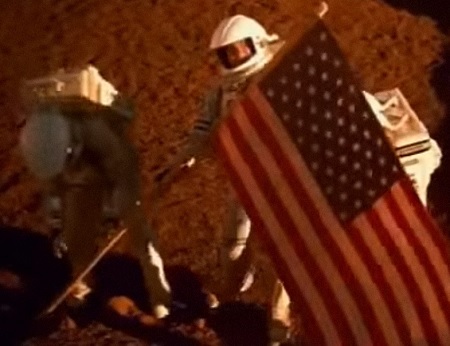 I don’t agree on the criticism for Mission to Mars, but I understand that I’m with the minority that really liked it. In fact I loved both movies. One took the “sci-fantasy” approach and the other a more realistic one. But I think no one saw Mission to Mars the same way as I have. The Ennio Morricone music, the possibility of other theory of the beginning of life on Earth. It was amazing. My personal opinion is that it was underrated and misunderstood. People today seems to not want to be amazed with fantasy mixed with reality. Is completely one or the other. So, if you put fantasy on a realistic ground, you are screwed. That happened to a lot of good movies. Today people, with Internet and all seems to like to be smart-asses all the way, and don’t want to play naive and innocent even for a small time, for opening their minds to a long-shot looney approach to a movie. I think that’s why Mission to Mars is so different to other space movies. And I agree that it took The Abyss way, the same as the last Indiana Jones movie, that I liked a lot too, but the rest didn’t. So, I feel as alone as Matt Damon on Mars, loving Mission to Mars all the way from start to ending, with child-like tears everytime I see Gary Sinise do the “Close Encounters of the Third Kind” trip to another world. Sorry for my english. See ya. G.
I really appreciate you sharing your thoughts so frankly and kindly. I definitely don’t mean to be rude or discount other people’s feelings on films. I, too, like plenty of films that other people hate, like X-Men Origins: Wolverine. There’s plenty of thought and attention to detail that went into Mission to Mars. The film just falls into the same category as Red Planet and Armageddon for me. It’s a movie where the characters keep going from one crisis to another with little breathing room for meaningful character development. It’s an exhausting and tiresome experience. In The Abyss, things keep going wrong, but they don’t dwell on the problems, but use them as an obstacle on the path to discovering the wonder of alien life. I feel like that film better captures the spirit of Close Encounters of the Third Kind than Mission to Mars does. Again, thank you for your wonderful comment. You are very kind. I am reminded of the movie Red Planet that has a similar plot. 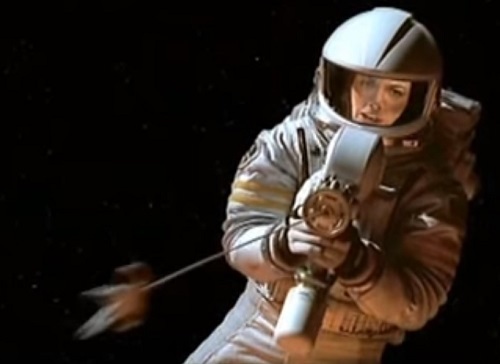 Strong female captain, Carrie Ann Moss and a resourceful survivor, Val Kilmer, that uses a pre existing craft to barely escape dangerous the Martian surface. Very true. I thought that movie was even harder to watch than Mission to Mars. I only saw it once, but yeah, it was pretty similar. It just had a really strange excuse for Val Kilmer to have breathable air on the surface of Mars. 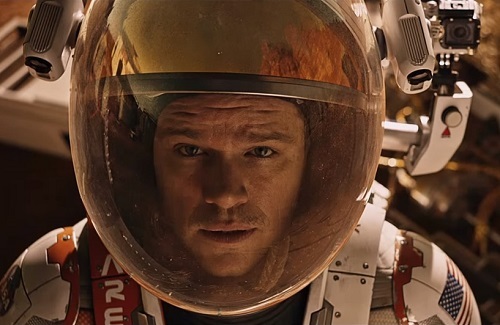 “The Martian” is a product of someone else’s artistic creativity. The entire movie is ripped-off from Brian DePalma’s excellent “Mission to Mars”. The original, “Mission to Mars” is a better movie.